SuperZoo 2017 has already come and gone, and this year's pet trade show was certainly one for the books. Over 10,000 pet professionals turned up for the educational seminars, lectures, and multitude of pet products that were presented at the show. New features accommodated a larger and more varied audience including the International Lounge and the Aquatic Lounge. Additionally, a new Animal Wellness & Retail series of talks on the show floor also helped pet professionals become more educated throughout their time in Las Vegas. Along with all of this was, of course, plenty of pet products galore. Because of this, Global Pet Expo and SuperZoo are the best environments for gaining an understanding of pet industry trends to come. So what were some of the trends that we took away from SuperZoo 2017? Ultimately, they support the humanization of pets. Pet products are all being geared toward one thing: increasingly and efficiently incorporating pets into daily life. When you shop for new furniture for your home, you probably think of pieces like a couch, coffee table, and end table for your living room. What you may not have considered, at least not until recently, is a piece of furniture especially for your pets. And let's be clear: by pet furniture, we're not talking about a wire dog kennel or the cheapest carpeted cat condo you can find. Pet furniture is being taken up a notch as pet humanization turns plastic dog crates to furniture-grade wooden pens and homes. Dog and cat beds are using high quality materials and fabrics and being designed with home design trends in mind. Does your dog or cat like to travel? Those looking to take their pets on the go have a selection of high-end pet carriers that are more aesthetically pleasing than in previous years. Conversely, for those who don't want to carry their pet - pet strollers are still on the rise. In fact, many people were even found pushing their chihuahuas around the show floor! Have you heard that pet food trends are following human food trends? This has certainly not been more prevalent than it was on the show floor at SuperZoo. The biggest indicator is that pet food is increasingly all-natural and being made with authentic and transparent manufacturing. Additionally, there is a draw toward varied food formats, with an extra push for raw variations of both cat and dog food. Many companies are trying to simplify the raw diet as much as possible and make it accessible to more people, even if its just sprinkling some dehydrated meat toppers. To make feeding raw pet food easier and more efficient for pet owners, one brand came out with pre-made meals that contained a variety of their pet food products and many companies were also showcasing raw pet food that consumers can just simply add water to. Furthermore, large pet food brands are also jumping on the natural pet food bandwagon. While they are still very much competing with smaller manufacturers, previously insignificant natural pet food companies are increasing their brand presence as demand for natural pet food increases. You may remember how, in the pet industry's past, pet food was such low quality that you wouldn't want to smell it, much less look at it? These days, manufacturers have improved their processes so much that many of them are proud to show it off - and did so at the show. You couldn't walk by more than a couple of booths without seeing food and treats laid out for show attendees to touch, smell, and even taste! The words "made in USA" aren't going anywhere - but many of those that may have been previously misleading are being clarified with additional statements such as "sourced in USA" and so on. Additionally, manufacturing practices are being marketed as "sustainable" and "completely natural" which has been in demand by consumers as authenticity and transparency became a clear indicator of brand quality. These are some of the insights we took from the show. 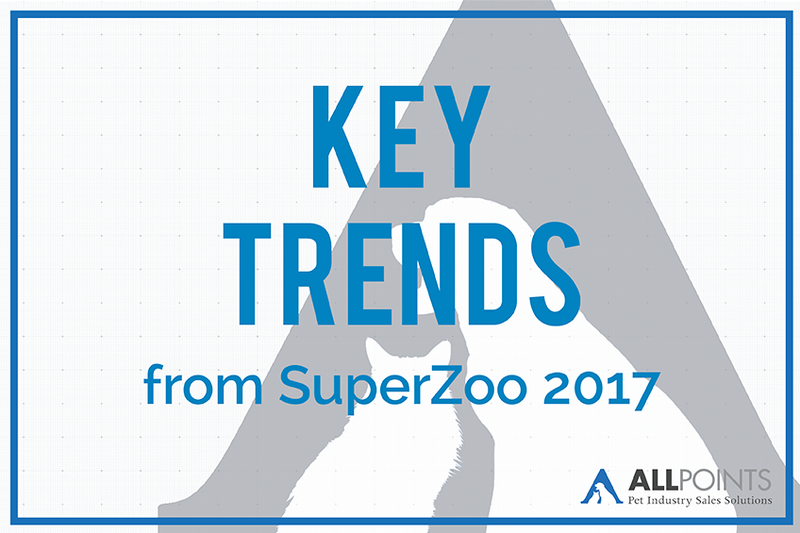 It's worth noting that, among these insights, we also noticed many of Global Pet Expo's trends continued during SuperZoo this year. All-in-all, it was a great time to catch up with pet professionals, take a look at upcoming trends, and get a taste of what's to come in 2018. Remember, SuperZoo 2018 is a month earlier - with show dates being June 26th through 28th in 2018. Registration should be open early next year, with expected date being sometime in January 2018. Ashley Hoffman is a freelance content marketer in the pet and design industries. Growing up in the pet industry, she has keen insight on market trends and a passion for helping small businesses grow. Her portfolio includes various topics from pet food trends to using technology and marketing strategies to boost pet business sales. When she's not writing articles or working her day job, she's playing with her two cats (Kitty and Chewbacca), reading a book, or hiking one of Washington's many trails.